Bulgarian Home Care is specialized in garden maintenance - we do regular grass and hedge cutting and can offer site clearance for gardens that have simply got out of hand. We offer pruning, felling, lopping, grass and hedge cutting, garden clearance. 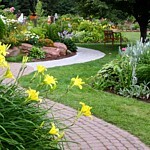 We can make regular visits to keep the garden of your holiday home looking trim and attractive for visitors to enjoy. Single Visits - We will carry out a single visit to your garden to cut the grass, tidy the flower beds, trim hedges and prune trees or shrubs, turf laying etc. Lawn Cutting - We can visit your garden at a period per your requirements to cut your lawn throughout the year. We will charge a set price per visit for the service and supply all the machinery needed to keep your lawn looking neat and tidy. Contract Garden Maintenance - This service is perfect for those who are too busy or unable to look after their garden and can include: Grass cutting, Hedge cutting, Pruning, Border maintenance, Feeding the lawn/shrubs, Weed control, pond maintenance - according your own garden needs. Initial Landscaping - our team will draw up individual landscaping project, appropriate to the owner needs - planting new grass, threes, flowers etc.